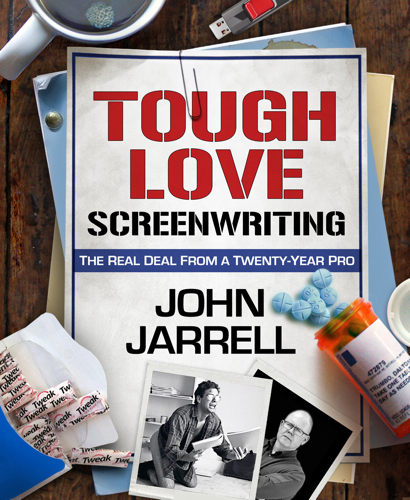 Tough Love Screenwriting is NOT another dreaded “how to write” book. It’s also not the extremely popular Save The Cat. Or How To Write a Screenplay in Twelve Seconds. Or Ten Easy Steps to Becoming a Hollywood Script Zen Master. Or any other mass-marketed screenwriting hustle based on shortcuts, gimmicks, getting rich quick, smarmy “plug in your story” paradigms or the “what Hollywood wants” approach. So exactly what is Tough Love? A brass-knuckles, boots on the ground guide to building both a paid screenwriting career and a professional level of craft — written by a guy who’s made his living doing it for over two decades. There’s a critical mass of street knowledge essential to any screenwriter’s survival, and that’s in addition to the ball-shattering task of writing well — yet precious few sources outside the Business seem interested in sharing the 411 or giving the fresh meat a fair warning heads-up. This books seeks to remedy that. And unlike 99% of the cottage industry books, classes and webinars out there — 99% created by people who haven’t made a dime in the real-life Film Industry — these pages come from the direct, firsthand experience of a produced professional who’s sold scripts, had a hit movie, been hired on numerous writing assignments, dealt with sadistic studio deadlines and handled crazy producers, directors and actors at their most extreme. Massive Bonus — it also includes THE FIRST COMPREHENSIVE GUIDE TO WRITERS GUILD CREDIT ARBITRATION by anyone, anywhere — written by a WGA Screen Credits Committee member with vast personal experience on all sides of the Arbitration aisle. Ultimately, Tough Love Screenwriting is aimed at the dedicated writer, the pragmatic dreamer who has pledged themselves to their craft, regardless of results, come Hell or high water, win lose or draw. The straight-shooting individual who understands the odds of becoming a successful screen or television writer are long, but certainly not impossible; and that superb storytelling and stellar writing are your best tools when scaling Hollywood’s unforgiving granite walls. Bottom line, there is nothing else like Tough Love out there. It’s a wicked fun read guaranteed to get you laughing in some pretty twisted ways. But beware — this book is not gluten-free. It doesn’t nurture your heart chakra and not everybody gets a trophy. Tough Love prides itself on presenting the brutal truth without pulling punches, whether you dig it or not. It’s as much combat field manual as practical navigational guide and memoir. Tough Love Screenwriting is essentially the book I wish someone had given me when I first came to Hollywood. One shrewd dose would have saved me years of blind, unsuccessful struggle. Hopefully reading it will save you the same. John Jarrell is a produced screenwriter with twenty-plus years in the Film Industry. He's written films for most of the major studios and has worked with many of Hollywood's best producers and directors, including Jeffrey Katzenberg, Joel Silver, John Woo & Terence Chang, Neal Moritz, Mike Medavoy, Luc Besson, Carl Beverly and Warren Littlefield. John is also a member of the WGA Screen Credits Committee.